What a match: neo-fascist industrial band Laibach will play a concert in North Korea. Clickbait aggregators, news-bite feeds and lame TV comedians with late night talk shows devoured it following Laibach’s media missive in June 2015. Typically, it added to the centrifugal force field of disinformation encasing the Democratic People’s Republic of Korea (DPRK) since Kim Jong-un’s bloodline ascendancy to Supreme Leader in late 2011. Superficially read, Laibach’s touting of a tour to the demonised North perfectly synchronises with a slew of pseudo-investigative, morally outraged anti-nuclear projects claiming to ‘expose’ in some way the terror and insanity of North Korea. Everyone (especially those with young families) seems to be teetering on the edge to see whether the DPRK will become the ultimate demon of the new millennium by launching a nuclear war. While many regard this as an urgent topical issue for global responsibility, the urge to anxiously respond to any floating news node relating to the DPRK’s official proclamations is reflexively powered by irrational fears and fantastical projections. Some readers may be signing off here, but my point is to clear some critical ground to consider (a) how Laibach — a notoriously misunderstood highly-politicised collective addressing radical notions of national identity — have articulated a contentious yet rational relationship with the DPRK, and (b) how the documentary of their concert seems oblivious to both entities’ ‘post-political’ stances and in place replicates the lazy assumptions people hold of each. 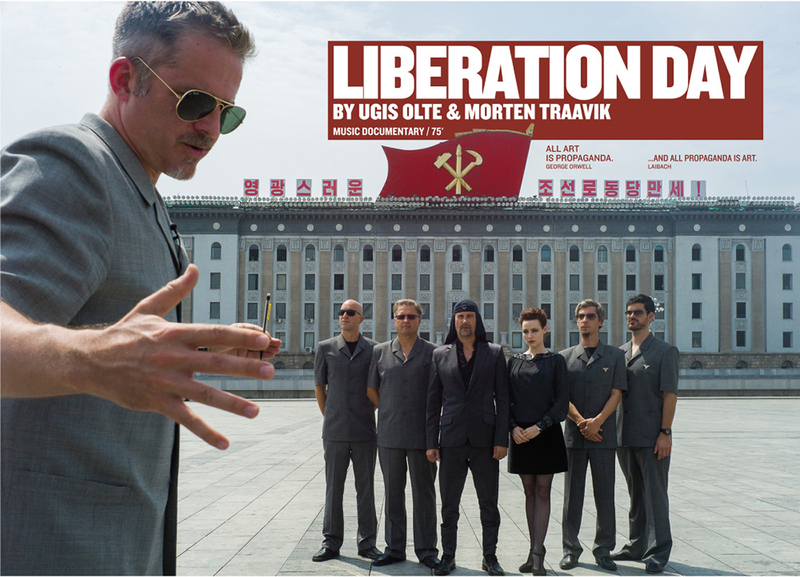 The documentary is Liberation Day (2016), directed by Ugis Olte & Morten Traavik. In standard fashion, it follows the travails of Laibach attempting to perform a concert in Pyongyang. The bulk of the footage captures the protracted protocols which seem intent on retarding Laibach’s genuine desire to play there. While the documentary notes how the mostly non-music press had largely treated Laibach’s strategic event as either comical, absurd, duplicitous or delusional, Olte and Traavik unfortunately do little to support or clarify the seriousness of Laibach’s intentions or aims. Some comment on Laibach is therefore warranted. The collective has long traded in seemingly offensive presentations designed to affront liberal sensibilities. At least, such was a punkish prankster guise in the early 1980s when Laibach became critical darlings in the UK and later were signed to Mute Records. Filed under “Industrial Music,” the band’s presence within English-speaking channels of performance and distribution was submerged by a glut of similar fetishistic bands, ranging from Throbbing Gristle and SPK through to Depeche Mode and Rammstein. Within this milieu, pre-WWII iconography was furiously and — in most instances — naively appropriated in an oil-and-water swirl of Teutonic, Aryan, Gothic, Neo-classical, Supremativist, Bolshevik and Proletariat imagery. Conversely, Laibach were always specifically engaged with the pre-Modernist pre-globalising historical specificity of their home turf of Slovenia (Laibach is the German name of the country’s capital Ljubljana) and how their identity had been rerouted by both Yugoslavian and SFRY formations since 1918, and further detourned through NATO interventions and manoeuvres since 1991. Indeed, Laibach — and their link to the art collective Irwin (part of the broader grouping of the umbrella organisation Neue Slowenische Kunst) presage much of the cultural identity politics which have excited contemporary art’s global biennale grandstanding in the 21st century. Watching Liberation Day reminded me of this, but also made me realise how Laibach have been hiding in the light ever since the Bosnian/Serbian conflicts of the early 1990s. To still treat them as a cabaret band posturing politics (which, admittedly, is a governing aesthetic for the Mute roster) implies a dismissive reading of their pop/rock status while ignoring the hardened seriousness with which Laibach have expressed their own globalist critique. Everything I am asserting here is neither visible nor audible in Liberation Day. Yet I remain confused as to why this is the case. On the one hand, the documentary is yet another insensitive incursion into a foreign culture while laying great claim to understanding that culture. The film abounds with moments where — in my view — Olte exhibits arrogant attitudes towards both the people of DPRK and the hapless go-between assigned to handle these strange foreigners as they attempt to implement their grandiose scheme. But is this all staged? Is Olte deliberately characterising himself this way, as part of an elaborate Banksy/Jackass/Vice­-style media gag? And is there a specific reason why the key Laibach musicians remain largely silent throughout the film (apart from officiated interjections by original group director Ivan Novak)? I’d like to think that in some measure, Laibach actually let their art speak for itself — such as when they perform a special mock-concert, sampling some of the tracks for the forthcoming one. The fiery hoop set for the band is that the DPRK censorship board wish to see and hear the concert themselves so they can decide whether or not it can proceed for the public. Frustrations abound in the preparations for this contrived and stressful event, and this constitutes the central core of the film. But stepping back from the obvious, anyone who has engaged in mounting largish theatrical productions in foreign countries can attest to this being the norm in the trade. Liberation Day’s framing of this as a distinctively DRPK tactic is a bit disingenuous. The key song Laibach performs here — which is disallowed in the final concert — is a mind-boggling mash-up of “Do-Re-Mi” from The Sound Of Music and the unofficial ‘anthem’ for DPRK, the winsome folk song “Arirang.” Laibach perform it in their distinctive morbid militaristic dirge style, with Milan Fras intoning the former’s lyrics like a lowlands Bohemian behemoth, while a truly innocent young girls’ choir generates dulcet tones of the latter. Adding to this, Mina Spiler admirably attempts to sing “Arirang” in Korean to provide a Bach-like counterpoint. It’s a weird moment. On paper, it reads simultaneously as a glib Pop-ist gesture and an earnest symbolic statement of cross-border unification (which, lest we forget, has been at the core of Laibach’s poetics, aesthetics and politics). In the film, it’s magical: all discursive and contextual framing evaporates into air — not the politicised air preferred by Marxist apologists, but the culturally dense noise field which defines the terrain of popular music. It’s a world away from the camp cynicism which would normally frame any reference to Julie Andrews warbling in The Sound Of Music. Under Laibach’s reterritorialising gaze, the original Broadway play and the subsequent Hollywood film’s (1965) bizarre meld of musicalized Aryanism and corporatised Zionism are recalled rather than repressed. Milan’s voice sounds tender; the girls’ chorale sounds ghostly; Mina’s enunciation sounds forlorn. It is the sad tonality of de-unification. For all its quasi-interventionist chutzpah, Liberation Day comes nowhere near the committed staging of this performance’s transnationalist punch. Fortunately, the film attests to the power of music, sound and song despite a documentarian’s attempt to rationalise their effects. Director Olte pontificates on-camera in numerous interludes, set against brutalist architectural backdrops of the DPRK, but his rote sociological quips about art and society quickly pale. Again, this could be a deliberate pompous tick, but when Laibach pulls out their “Do-Re-Mi,” Olte’s journalistic rhetoric sounds banal and trivial in comparison. Ultimately, the film is full of suspect sleight-of-hand in its editing and narrative framing which obfuscates the contextual truths which shape DPRK in ways beyond our outsider wishful thinking. (The edits of the audience’s reactions while Laibach finally perform seem suspicious and over-weighted to me.) One of the most powerful aspects of the DPRK is its unknowable logic, its holistic otherness, and its political anti-contemporaneity. For those who think they ‘know’ North Korea through our available media channels (especially those bent on investigative exposes of “the insanity of the North”), Liberation Day will reinforce the terrible clichés born of ‘weirdising’ another world. I sense that Laibach truly identify with the DPRK due to the meta-linguistic disinformation which decontextualises both parties’ discourse to the world. Therein lies Laibach’s presence: uncomfortably grappling with their performance in Pyongyang, while trapped within this documentary’s journalistic dance. 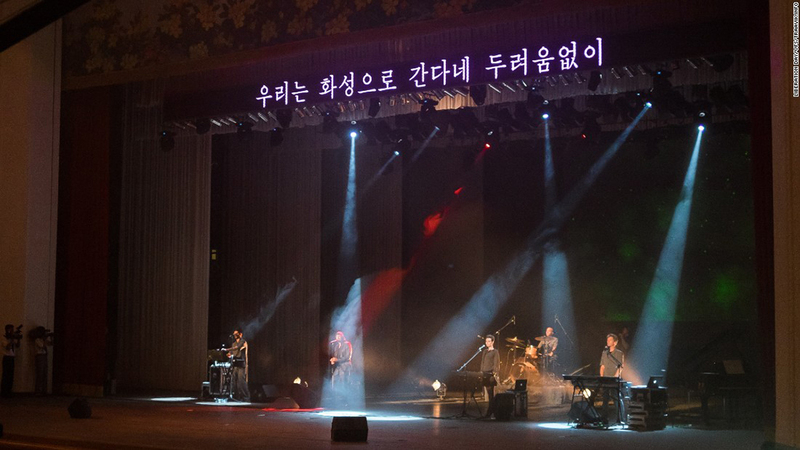 See excerpts from the Pyongyang concert and read an interview with Laibach about the visit to North Korea.